Onboard videos of race cars are almost taken for granted nowadays, given how easily accessible they are. 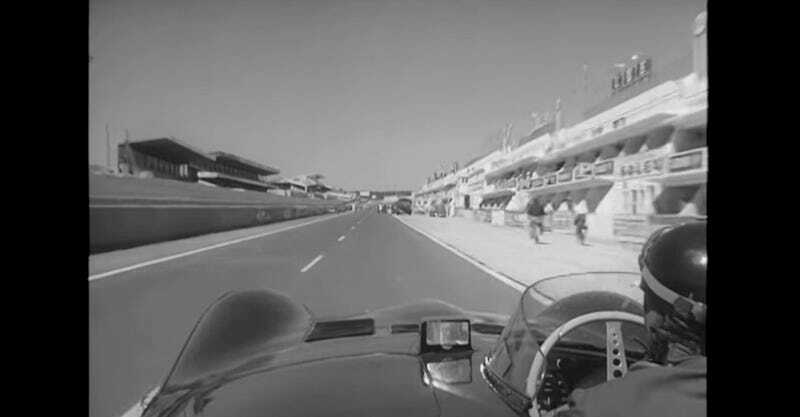 But it’s rare as hell to find a halfway decent onboard footage from the golden era of racing—so take a few minutes and take a lap of the Le Mans circuit with Mike Hawthorn, the UK’s first F1 World Champion, behind the wheel of a D-Type Jaguar. This lap of Le Mans isn’t during a race or qualifying—in fact, it’s pretty leisurely. You can see folks driving in the opposite lane every now and then, since Hawthorn is cruising down public roads. But it’s an interesting look at the track and the cars back in the day. And the video quality is surprisingly good. I think the best thing about this video is the microphone strapped to Hawthorn’s face. It’s a frankly terrifying contraption, but you also get some insight into how drivers interpreted the circuit back then. Hawthorn’s career is a wild one for someone who only competed for six years. He won the infamous 1955 Le Mans race that killed as many as 130 people. He won the F1 World Championship in 1958 before retiring. His list of wins is a long one, from sports cars to single-seaters. Hawthorn died in a road accident just after his retirement in 1958.